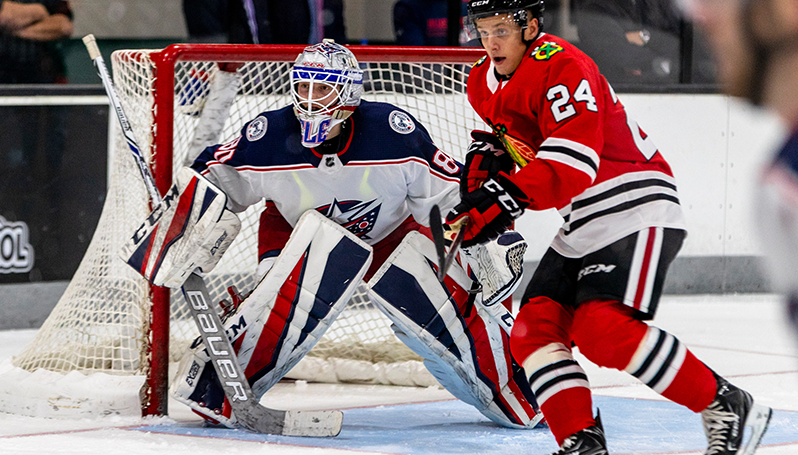 TRAVERSE CITY, MICH. – Alexandre Fortin converted on a penalty shot late in the third period to cut a 4-2 deficit in half, but the Chicago Blackhawks prospects’ late comeback fell one goal short in a 4-3 loss to the Columbus Blue Jackets in the opening game of the 2018 NHL Prospect Tournament Friday afternoon at Centre Ice Arena. With the contest knotted 2-2 after two periods, Columbus sprinted out of the gates in the third, potting two goals within the first 11 minutes of play. Kevin Stenlund gave the Blue Jackets the lead with a laser from the slot 6:35 into the final frame, before Sam Vigneault netted the game-winner with a shot that just flipped over Chicago netminder Kevin Lankinen. Vigneault scored shorthanded as Columbus successfully killed off each of the Blackhawks’ five power-play opportunities. Fortin fired home his first goal of the tournament on a penalty shot, beating Matiss Kivlenieks at 16:54 in the third period. Nicolas Baeudin also scored a goal and picked up an assist for the lone multi-point effort of the contest, and Dylan Sikura lit the lamp in the waning minutes of the second period for Chicago’s second marker of the game. Beaudin was set up by a great centering pass from Dominik Kahun, and he blasted a quick shot past Kivlenieks to tie the game 1-1. Sikura then cashed in on a feed from Beaudin to send the game into the second intermission at 2-2. Despite swapping goals through the early going, Columbus outshot Chicago 12-5 in the first period and 29-21 overall in the game. Lankinen turned away 25 of 29 pucks for the Blackhawks, while Kivlenieks stopped 18 of 21 shots in the win.